A fire lance as depicted in the Huolongjing. The fire lance (simplified Chinese: 火枪; traditional Chinese: 火槍; pinyin: huǒ qiāng) was a very early gunpowder weapon that appeared in 10th-century China during the Jin-Song Wars. It began as a small pyrotechnic device attached to a spear-like weapon, used to gain a critical shock advantage right at the start of a melee. As gunpowder improved, the explosive discharge was increased, and debris or pellets added, giving it some of the effects of a combination modern flamethrower and shotgun, but with a very short range (3 meters or less), and only one shot (some were designed for two shots). In later larger and more powerful fire lances, the lance-point was discarded, as these versions were too unwieldy to be used in melee. These are considered to be a proto-gun, the predecessor of the hand cannon, and the ancestor of all firearms. Some fire lances were too large for a single man to wield. These were placed upon the ground in a supporting framework, and can be considered proto-cannons. Metal fire lance barrels appeared around the mid-13th century and these began to be used independently of the lance itself. The independent metal barrel was known as an 'eruptor' and became the forerunner of the hand cannon. To make the lance, use chi-huang paper, sixteen layers of it for the tube, and make it a bit longer than two feet. Stuff it with willow charcoal, iron fragments, magnet ends, sulfur, white arsenic [probably an error that should mean saltpeter], and other ingredients, and put a fuse to the end. Each troop has hanging on him a little iron pot to keep fire [probably hot coals], and when it's time to do battle, the flames shoot out the front of the lance more than ten feet, and when the gunpowder is depleted, the tube isn't destroyed. The Mongol soldiers which they were used against were apparently disdainful of other Jin weapons, but greatly feared the fire lance. Jin soldiers also used them in open combat and in one instance, a contingent of 450 fire lancers routed an entire Mongol encampment. Earliest known representation of a fire lance (upper right), Dunhuang, 950 AD. 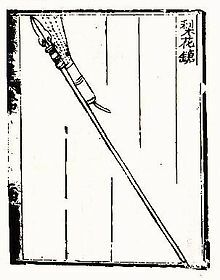 A fire lance from the Wubei Zhi. A double barreled fire lance from the Huolongjing. Supposedly they fired in succession, and the second one is lit automatically after the first barrel finishes firing. The phalanx-charging fire-gourd, one of many fire lance types discharging lead pellets in the gunpowder blast, an illustration from the Huolongjing. An 'awe-inspiring fierce-fire yaksha gun' as depicted in the Huolongjing. A 'lotus bunch' as depicted in the Huolongjing. It is a bamboo tube firing darts along with flames. A 'sky-filling spurting-tube' as depicted in the Huolongjing. A bamboo tube filled with a mixture of gunpowder and porcelain fragments. A 'bandit-striking penetrating gun' as depicted in the Huolongjing. The first known metal barreled fire lance, it throws low nitrate gunpowder flames along with coviative missiles. A 'divine moving phalanx-breaking fierce-fire sword-shield' as depicted in the Huolongjing. A mobile shield fitted with fire lances used to break enemy formations. Essentially a fire lance on a frame, the 'multiple bullets magazine eruptor' shoots lead shots, which are loaded in a magazine and fed into the barrel when turned around on its axis. A 'poison fog magic smoke eruptor' as depicted in the Huolongjing. Small shells emitting poisonous smoke are fired. Illustrations of fire lances from De la pirotechnia by Vannoccio Biringuccio ca. 1540. ^ a b Andrade 2016, p. 38. ^ Andrade 2016, p. 33. ^ a b Andrade 2016, p. 51. ^ Needham 1986, p. 222. ^ Chase 2003, p. 31. ^ Lorge 2008, p. 33-34. ^ a b c Andrade 2016, p. 52. ^ Andrade 2016, p. 46. ^ Andrade 2016, p. 47. ^ Needham 1986, p. 228. ^ Needham 1986, p. 259. ^ Needham 1986, p. 260. ^ Needham 1986, p. 262. Benton, Captain James G. (1862). A Course of Instruction in Ordnance and Gunnery (2 ed.). West Point, New York: Thomas Publications. ISBN 1-57747-079-6. Chase, Kenneth (2003), Firearms: A Global History to 1700, Cambridge University Press, ISBN 0-521-82274-2 . Crosby, Alfred W. (2002), Throwing Fire: Projectile Technology Through History, Cambridge University Press, ISBN 0-521-79158-8 . Kelly, Jack (2004), Gunpowder: Alchemy, Bombards, & Pyrotechnics: The History of the Explosive that Changed the World, Basic Books, ISBN 0-465-03718-6 . Konstam, Angus (2002), Renaissance War Galley 1470-1590, Osprey Publisher Ltd. .
Needham, Joseph (1986), Science & Civilisation in China, V:5 pt. 7: The Gunpowder Epic, Cambridge University Press, ISBN 0-521-30358-3 . Swope, Kenneth M. (2013), The Military Collapse of China's Ming Dynasty, 1618-44 (Asian States and Empires), Routledge . This page was last edited on 16 March 2019, at 08:20 (UTC).